Corsa Cucina at the Wynn Las Vegas Casino Resort has been operating since the hotel’s auspicious opening more than two years ago. It’s been guided by several chefs, and is now captained by the experienced hand of Alessandro Stratta, owner of Alex, also located in the Wynn. The cuisine at Corsa Cucina is billed as ‘casual Italian,’ and draws a brisk crowd in its location across from the theaters. The restaurant occupies a corner space adjacent to the ticket office and the Grail Theater. This location is key – it ensures there are always hungry diners ready and willing to come and dine, even without a reservation. The restaurant is richly hued in burgundy tones, but with eclectic décor, featuring ceiling units hanging with sanded pine branches randomly placed within. Seating consists of tables facing a long bench seat along the wall, as well as more tables scattered across all available floor space. Tables are closely spaced, but Corsa doesn’t lack intimacy – the volume remains fairly well under control. The tables are set with formal linens and silverware, and the settings are quite lovely. 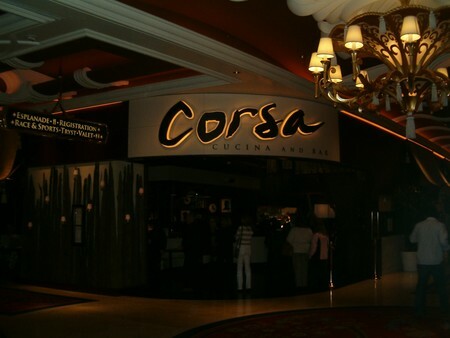 We arrive at Corsa Cucina on a busy Friday night, with an early reservation. 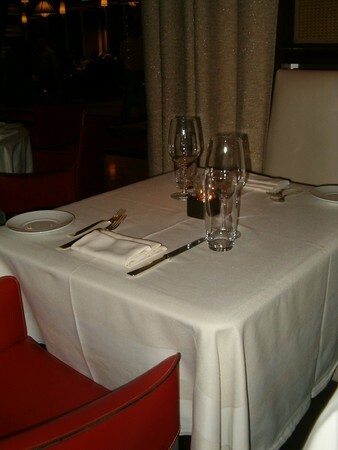 We are promptly shown to a table, where the hostess places our napkins in our laps for us. Our server, Michael, arrives and introduces himself, bringing an assortment of breads in a silver basket, as well as a white, double-sided dish filled with pesto. The basket has a variety that includes thick, artisan-type breads, thin flatbreads, and rustic homemade pretzels, and they are all savory, flavorful, and a delightful accompaniment to the pesto. I order a glass of red wine to begin the meal, and it is delivered in a small decanter and poured tableside. 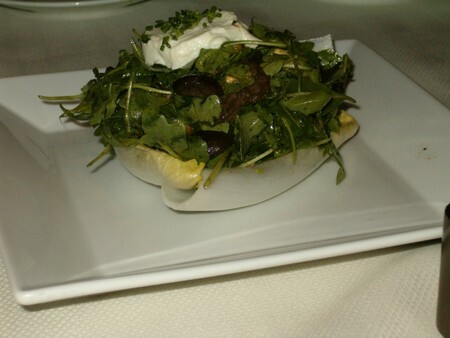 We begin our meal with the Corsa Salad, as well as one of the restaurant’s signature pizzettes. The salad is rich with goat cheese, avocado, arugula, corn, and mushrooms in a balsamic dressing. The presentation is lovely: the salad is heaped onto an immaculate square white plate. All components are blended together, except for the goat cheese, which rests on top. The wild mushrooms are in large pieces, rather than disguised and unidentifiable. It’s a complex blend of textures, and a new feel and taste in every bite. It’s not necessarily a dish to share if dining with kids – it’s a sophisticated salad, and all of the components, from salty, to creamy, to chewy, combine into a dish that’s both beautiful and delicious. This salad will prove to be a high note in the entire meal, and something we will return to have again. We choose the Wild Mushroom Pizzette as our other appetizer. 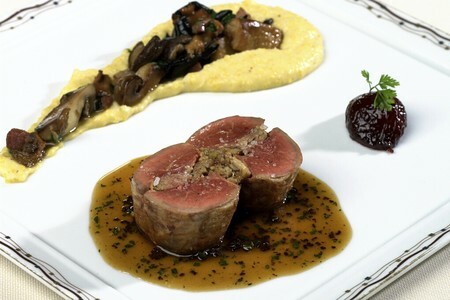 It is topped with mushroom puree, Robiola cheese, and white truffle oil. It’s essentially a wonderfully topped flatbread. The cheese and truffle oil make it rich and decadent, and the mushrooms lend an earthy tone and substance. The tone of our dinner progresses from lighter to heavier. After the lighter salad and pizzette, we try the heavier Gnocchi with a Gorgonzola and walnut sauce. It’s plated simply, with the bite-sized gnocchi in the center of the square plate, topped with the sauce. This dish is the big hit with my dining companions. For those who love pasta, and potatoes, it’s clearly the best of all worlds. The sauce is smooth and silky, save for the walnut pieces, and the gorgonzola provides depth to the sauce. It is a relatively heavy dish, though, and best not to fill up too much, before the entrées arrive. Our server, Michael, ensures that our needs are met, up to and including our dish and silverware replacement between courses, as well as the crumb sweeping. These touches may seem minor, but they make a difference between a meal that‘s merely ‘fine,’ and one that’s truly memorable. 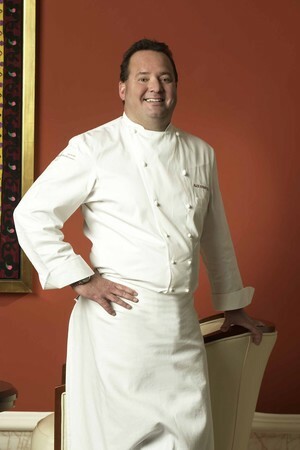 Michael is also instrumental in making recommendations as to what the specialties are, and what might appeal most to us. His patience is appreciated. Our first entrée arrives. Entrees are served a la carte. It is Roasted Chicken, on wild mushrooms and roasted garlic. This dish is served simply, a bone-in leg and thigh portion resting on the vegetables and sauce. There’s no garnish. Nothing else clutters up the plate. The chicken is good, well seasoned, nicely roasted, but the mushroom and garlic medley with sauce is the real star, savory, flavorful, and complex. The roasted garlic is sweet, and the mushrooms are earthy. 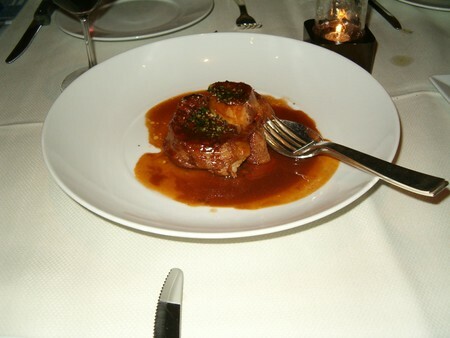 Our final entrée is the veal Osso Buco. A word to the wise: if dining alone, order more than just this dish. 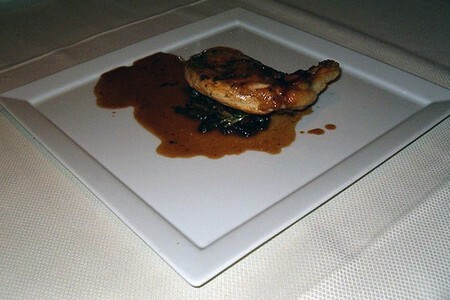 As it arrives a la carte, a plate is placed on the table, with a veal shank – nothing more. Again, the presentation is a perfectly white, square plate, with the dish perfectly centered – no garnish, nor vegetables on the side. The veal is tender, and soft, and falls off the bone – it’s been beautifully braised in wine. The shank isn’t the most meaty portion; however, the flavor is superb, if the portion a bit scant. We opt not to try Corsa Cucina’s desserts, though they look absolutely sinful. Combined with after-dinner coffee dessert drinks, they could be lethal. 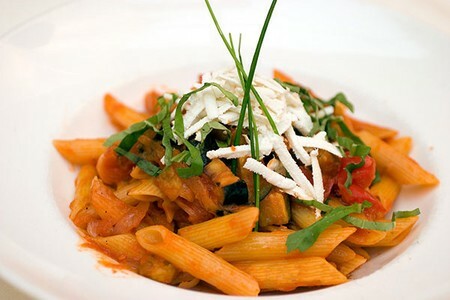 Corsa Cucina provides a provocative assortment of Italian bistro cuisine. Their food shows a deft touch, with an eye for authenticity. Some dishes have a real flair for creativity, with a flash of brilliance. The restaurant itself has ambiance typical of many casino restaurants – it can be a hotspot, and get quite busy, and the volume can make a quiet, romantic dinner a little challenging. It could be just the ticket after a night at the theater, or ideal for an early dinner.